For decades, artists and producers have been evolving the classic Roland TR-808 and TR-909 drum sounds. The Roland TR-8 Rhythm Performer gives you those timeless sounds, along with the capacity to manipulate, sequence and affect them in real time. Now, the new Roland SP-404A Linear Wave Sampler takes this versatility even further, with the ability to incorporate non-TR-8 sounds into your TR-8 rhythms. This includes your own samples, which can be anything you’ve recorded, created or manipulated. It could be from your existing tracks, field recordings, hardware or software instruments…any audio that you like can be used! The SP-404A also includes a set of new, specially curated samples that are designed to work with the TR-8’s iconic X0X ACB instruments. In this article, we’ll show you how to set up your TR-8 with the SP-404A and outline the different ways that you can use it in a live performance. To sequence samples from your SP-404A into your TR-8, you will need the TR-8’s new 1.5 driver update. Firstly, make sure your TR-8’s update is current (that’s version 1.5). To check this, hold down pads 14 and 16 while switching the unit ON. The [START/STOP] button will blink. Press START. The LCD screen should say 150. If it does not, simply download and install the update from the Roland website here. Take a MIDI cable and connect the MIDI OUT from the TR-8 to the MIDI IN of the SP-404A. Then, take a dual RCA to dual ¼” jack cable and connect the LINE OUT of the SP-404A to the EXTERNAL IN of the TR-8. It’s as simple as that, you’re ready to go! Now, when you program a beat on the TR-8, go to Instrument Select Mode (DRUM SELECT – INST). As normal, your TR-808 and TR-909 sounds will display on the left (Pink for 808 and Yellow for 909). If you have the 7X7 upgrade, it will also display your 707 as Orange, 727 as Blue and 606 as White. Now, with the update installed, you will also see Step 16 blinking. This is where you can determine if you will also be using a sample on this instrument. So, if Step 16 is White, you are just using the TR-8 sound. If lit pale Yellow, it will trigger the TR-8 and the SP-404A, layering the sounds together. If lit pale Blue, it will trigger the SP-404A only. PRO TIP: You can tell what is triggered by what is blinking. So, if Step 16 is blinking and one of the Instrument Select Steps on the left is blinking, both instruments are being triggered. The TR-8 instruments map to the pads on the SP-404 sequentially. BD being the first instrument from the left triggers Pad 1, SD triggers Pad 2 and so on until RC, which triggers Pad 11. You can also trigger samples from different banks of the SP-404. With banks A-J, you have 110 samples that can be triggered by the TR-8. To select the bank that an instrument triggers, when in INST mode, you will see a letter on the LCD display. Turn the Tempo knob to scroll through A-J. You can select a different bank for each instrument, allowing you to mix and match from different banks. PRO TIP: When using longer samples, try setting the sample to loop on the SP-404A. Now you can use the TR-8 trigger signals to start and stop the sample. This enables you to gate the sample at different points, for creative sample chopping. Because the SP-404A is connected to the External Input, it is coming through the TR-8’s Side Chain. You can now sidechain your samples with your TR-8 beat. This is great for melodic elements and chords. PRO TIP: When using the SP-404A to play chords or pads, you might want the sample to run for a whole bar. To do this, save the different chords on the same pad, but in different banks of the SP-404A. Copy your TR-8 beat to sequential patterns and change the bank on each SP-404A trigger step. Now, you can join your patterns together to create a long evolving riff on the SP-404A. Since the SP-404A audio is coming in through the External In of the TR-8, the samples will stream directly to your DAW on channel 14 of the TR-8’s USB interface. This also enables you to sync the TR-8 and SP-404A to the MX-1 Performance Mixer or DJ-808 Controller over AIRA link. Finally, the TR-8 can also sequence other samplers and instruments by using this technique, but the MIDI CC values may not map accurately so you may get some unexpected results! 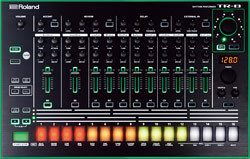 SHOULD YOU GET THE ROLAND TR-09 OR THE TR-8? > WHERE CAN I TRY A TR-8 IN STORE? Are you wasting money in your home recording studio?